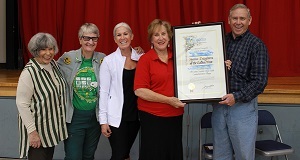 Last weekend, residents joined dozens of local organizations to celebrate the 80th anniversary of the Old Santa Susana Stage Road plaque which was installed by the Native Daughters of the Golden West on March 17, 1939. The Old Santa Susana Stage Road was used during the 19th century as a connection between the San Fernando and Simi Valleys. Stage coaches would often have to blindfold their horses as they made the perilous descent from one side to the other carrying mail, shipped goods, and other sundries. As infrastructure and technology improved, the old stage road ultimately went out of use but remains today as a hiking trail that showcases the natural beauty of our region. You can still clearly see the ruts made from stage coaches that passed through the trail over 100 years ago. In 1939, the Native Daughters of the Golden West -- an organization founded by California women whose mission is to preserve the history and heritage of our state -- took the step to mark the site of the Old Stage Road with a plaque acknowledging its important role in the history of our region. 80 years later, it's impressive to see how a culture of historic preservation is now ingrained into the culture of Chatsworth. Attendance at the anniversary celebration was not limited to the Native Daughters of the Golden West but included conservation and historic preservation groups of all kinds. While Chatsworth may have changed a great deal since the days of the Old Stage Road, the history and stories of our neighborhoods will continue to be told for generations.